This has been a year which I have not acquired many new things; I have really been appreciating what I have and finding many new ways to mix it all up..! 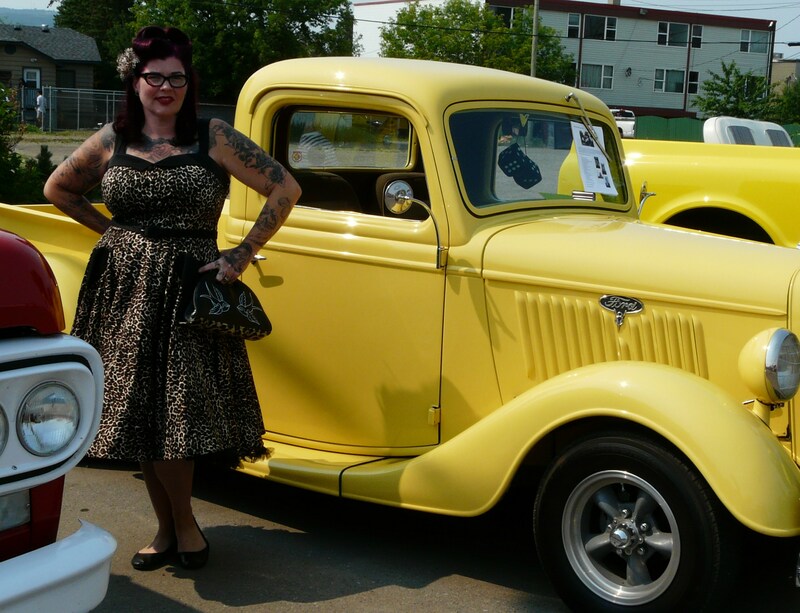 I knew the Dawson Creek Car Show was soon approaching and I really wanted to have a NEW dress for the show. 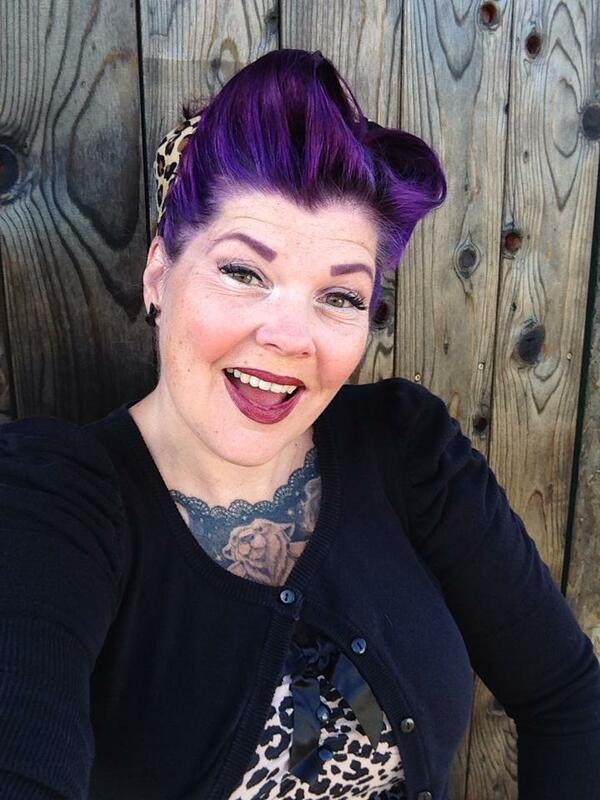 I had recently gone through a major undergoing to take my hair from black to purple and wanted a look to match. I had been eyeing the PUG Betsy dress for sometime at Rowena’s in Edmonton, AB. It came in different colour combinations yet I really adored the Leopard print as my logo I wear a Leo print dress and really I just cannot get enough of it..! 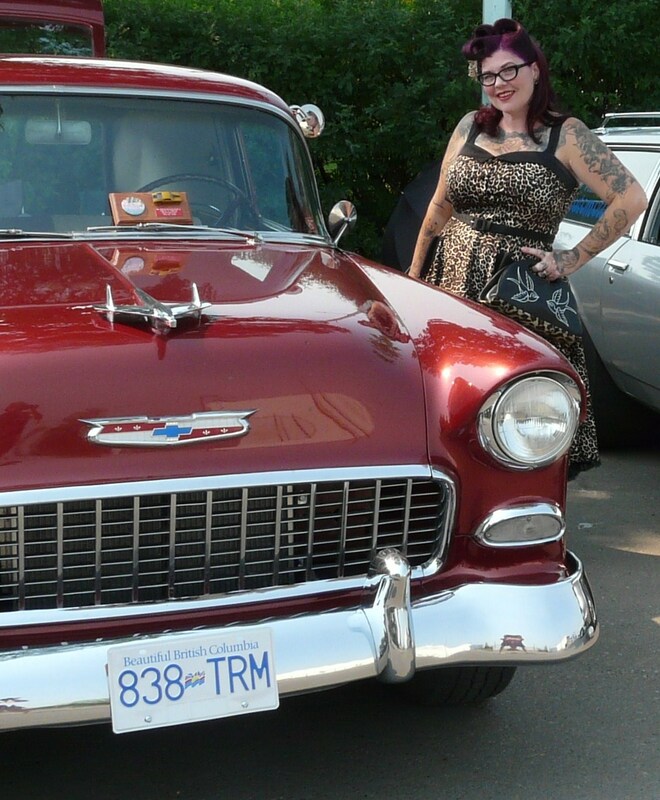 Never mind its super CUTE name that happens to be shared by my 54 Wagon, Betsy..! Where I live mail takes for ever and we do not have regular mail hours. I knew at this point is was too close time wise to order the dress so I was a little bummed yet picked out an equally smashing pick and started to plan from there. The Wednesday before the show my husband asked me to go check the post as he was waiting on a specific piece of mail and wanted to know sooner than later if it had arrived. So I hopped into the truck and headed out. I opened the post box and there were the usual news flyers and at the last moment I noticed that white card that indicates a parcel was waiting under my name… What could it be..? Who is it from..? As the Post woman handed me the pillow wrapped envelope I started to cry, I acknowledged the parcel came from Rowena’s and although I was perplexed as to why or what was in or about this parcel I just knew it was something I would adore and be pleased with. As I ran to the truck I tried to work at the plastic of the envelope to get a peak of its contents and to my surprise I could make out leopard print! Oh boy I was shocked, I actually sobbed all the drive home!! I could not possibly wrap my mind around how this dress came to be in my possession! After several nonsensical texts back and forth to my husband I discover he purchased the dress a week earlier in hopes the dress would get here on time. Oh I was beside myself. I successfully removed the dress from the package and quickly slipped into the dress. This was my first PUG dress that was not apart of the Netti or Heidi styling, as the zipper went up it truly fit like a dream. I was thrilled by the cute detailing of the buttons, the sweetheart neckline and the pockets, oh the super cute heart shaped pockets.. ❤ The bodice is lined with a nice satin which made the fabric lay beautifully and the length was a bit longer more like a Heidi than the shorter Netti. The Betsy fit true to the 2XL sizing and I was elated as I really appreciate the straps on the dress for summer occasions. This dress did not disappoint and I have since made many great captures in this dress. Dress looks outstanding on you! Very very pretty. A girlfriend of mine has the same dress and it look amazing on her too. Sign of a good dress!